Instantly I recognized that I did not want a purely dark bodice, as I feared it wouldn’t show well in photographs, or the scalemail detail would be lost. So I decided to stay away from black altogether, and instead actually stick with brighter colors, primarily towards the stomach region which is traditionally depicted as being lighter if not white. After browsing through the selection, and other images online, I found myself most attracted to the Champaign, gold, and bronze colors, but still could not decide of how much or the placement of the colors. In addition, I contemplated the use of the orange and reds since I know that would be the primary colors of my make-up and fabric (just because I wanted them to be). So I realized that I would have to buy starter packs to test the colors and general layout. 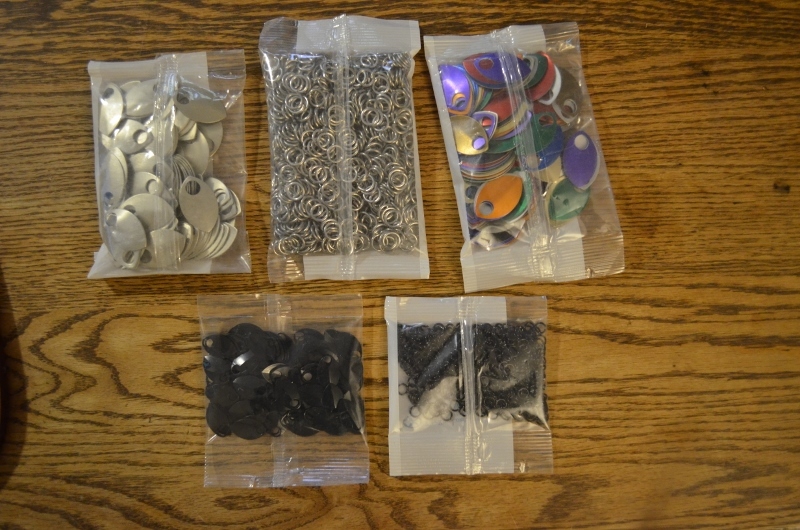 For my initial purchase, I bought two packages of large scale (100 pack) scalemail in Champaign and a mixed variety (5.6 $ each). The packages did not come with connectors, and I was torn by the bright aluminum back, and the stainless steel pack which was more expensive. Being that this was my trial pack, I decided to investigate the bright aluminum, as they were cheaper and could possibly be spray painted if the color was too obnoxious (4.5 $/750). Stefan wanted to get a sample of the small scale scalemail, which only came in black, to test as well for his own costume, but as well as make sure we were getting the right size (2$/100 pack + 4.6 $/400 rings). With shipping (11$), the order came to 33.35 $. It was ordered on the 5th, and arrived on the 17th. Admittedly I was a bit sticker shocked when I saw the shipping amount especially when taking into consideration the amount of time it would take for the scalemail to arrive, but I was guessing that the package might have been heavy. When I received the package, however, it was incredibly small and very light, and after a small weight test I found that a 100 pack of scales plus connectors to hold all together was about .4 lbs (around 125 grams), so the entire package itself was about a pound. Filled with a bit of nerd rage, I found it difficult to justify 11$ worth of shipping when I have not only received but also shipped 7 lbs worth of books or heavy board games for less than that. Learning from my mistake of sampling, I realized that the next purchase must be the final, and I would just have to make it work. After reviewing some of the tutorials on connecting scalemail in a basic pattern on the Ring Lord website, I created a 10 scale x 10 scale diamond (which came out to 9” x 9”), primarily out of Champaign colored scales with the few gold and bronze scales from the variety pack interweaved on the sides to get a sense of what the shade differences and transitions [first picture]. Having a fairly petite frame, I found that the 10 x 10 diamond easily covered my shoulder, breast, and most of my stomach (individually of course). From these initial space placements, it was easy to get inspired by the way the scalemail hung over the various parts of the torso, and from initial fittings I became quite attracted to a possible shoulder sleeve with a puffed out edge. I also realized that essentially the material could be purchased based (roughly) on the 10 x 10 diamonds over the torso. 2 diamonds for the chest, 2 diamonds for the breast, 3-4 for the stomach and sides, and approximately 1-2 for the back (although most of my back will be bare). This lead to about 6-9 packs, without considering the 100 I already had. I also found that the bright aluminum rings were barely visible, and least of all distracting. I’ve also considered doing a ribbon wrap around the visible halves of rings for a cleaner appearance. Stefan played with the small scalemail briefly, but it was clear that the size of the scale would be too expensive to cover any large portions over the body, nor display any of the detail he was hoping to convey. Instead, Stefan decided that he would also use the large scalemail for his stomach and lower back region of his costume, but instead of a champagne color, which was fairly bright and clean, he decided that he wanted to work with a slightly darker color. After much contemplation, he decided that he would tempered high carbon steel scalemail, which looked warn and even slightly singed which played into his costume brilliantly. For our final orders, I purchased 600 champagne scales (6 packs/ $5.04 each), 300 (3 packs/ $ 5.04 each) brushed gold scale to accompany my 100 scale I already had, and 5 packs of bright aluminum rings to share (750 ish/ pack at $ 4.05 each). This order was based on my original estimates, but I decided to get the larger end of my estimation. 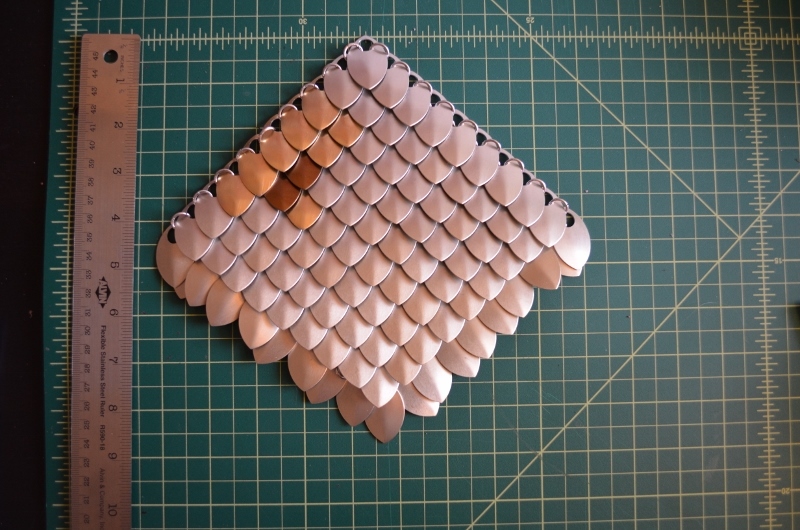 For Stefan, he reviewed some of the scalemail requirements for other projects, such as the scale vest kit which requires 2000 scalemail, and determined that on only doing half his torso that he would hopefully only need half of the scales. Hoping that it would be enough, Stefan decided upon 10 bags of large tempered high carbon steel scalemail (100/ pack at $5.15). With shipping ($ 16.21), the price came to $133.12. One of the most overlooked aspects of costume design and cosplay is financial costs, and often small incremental purchases ultimately lead to a large cost. Part of the cost is supplies, but a large percentage is also dedicated to essential tools that can be used on other projects. Part of the reason for the commitment to this costume specifically, even after calculating the potential cost of the entire project, was the reuse value of material, as certainly scalemail could be re-purposed into other costumes, or sold/ given to others to create their own designs. Also, there is an unexpressed value in the stunned and wowed expression of friends, family, general enthusiasts, costume designers, and cosplayers. At the end of this project, I will include a detailed cost analysis of the costume, including supplies and tools used to make.